Cando Vestibular Disc - 60cm. - 24"
Power Wheel II ships for free - LIMITED TIME OFFER! Voted "The Best" Core Trainer in the World! 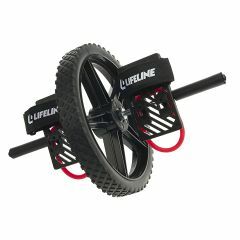 The Lifeline Power Wheel was voted "The Best" Core Trainer in the World! The power wheel was designed to fit both hands and feet, to dynamically improve core strength, power and balance. Train full body stability, strength, endurance and even POWER! The Power Wheel was designed to challenge the entire body to stabilize while moving. Because of its unique patented design, you can put your feet or your hands into the Power Wheel, so you can perform unlimited core exercises. And because of the top level instructional booklet and video included, you will learn the best way to to get your core (abs, back and surrounding muscles) to its most powerful level ever! Compact. Targets Muscles. Sturdy. Easy To Use. Multifunctional. Weight Loss. General Fitness. Stretching. This product lives up to it's hype. Don't waste time on similiar products that are small and not sturdy. Targets Muscles. Sturdy. Easy To Use. Back Pain Relief. General Fitness. Easy to use and very sturdy product. The capability to use the wheel mounted on the feet is a vast improvement over other designs and certainly worth the cost difference. Great for focused workouts or occasional sets to "grease the groove" and keep your core muscles firing. Easy To Use. Sturdy. Easy To Setup. Compact. Targets Muscles. Back Pain Relief. General Fitness. Stretching. Works entire core quads. One complaint: the right foot assembly will not slide down the axle to match the pre-assembled left foot pedal. It is sturdy & works. Be sure to watch the DVD prior to use. The exercises look easy enough -- they're NOT. Take your time & do a few minutes a couple times a day everyday till you build up your core & can do more. The results are REAL! Great for any martial artist/boxer! Sturdy. Targets Muscles. Easy To Use. Multifunctional. I love this product. I always thought that the little wheels were dumb. Then one day I tried the roll out w/ a 45# barbell w/ weight plates. UGH!!! Since I was having trouble, I decided to get a wheel... and I found this one. WOW!!! I love it. I allows you to go out a long way. The foot attachments are really firm (my kids love it as well), and you can even just put your forearms on the foot pads, so as not to aggrevate your elbows. I'm 6'5", 275 pounds and it even holds up to the abuse that I put it thru. Can't say enough about it. Compact. Easy To Use. Targets Muscles. Easy Setup. The Power Wheel is great! It is excellent for shoulder strength and rehabilitation, core strength development, and best of all, it is portable. I work as a Mobile Fitness Coach, and train clients in their homes or other convenient locations, so being able to transport this easily is a huge benefit. The PowerWheel itself is decent quality, I have had it for about two weeks, I am really hoping it can stand the test of time... Overall, great product - I would recommend it to anyone with an already well-established base of fitness.